Keep in touch with your family and friends anytime anywhere! 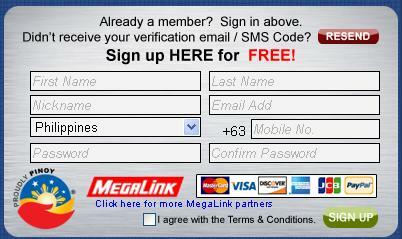 You may now reload your Philippine Mobile Prepaid Phone or send love ones gift certificates available from the page. These past few days, I have been battling myself on where to purchase load online. Been look looking for some legit online loading shop yet I failed to find one at first. My first experienced was from Fizzer but honestly after purchasing twice, I still end up not getting any load from them so I am saying this to please keep away from that page. I think I am in the position to say that. By the way, I know you will ask me why I purchased again after not getting my load at my first try; the reason was just to make sure if Fizzer is really a certified bogus online loading store. Like other online buying / shopping you might as well encountered bogus seller so you must be careful in picking up the right store for you. Here's a Guide to Online Buying that can somehow help you. Anyway, as I was saying, loading online is now possible which gives you less hassle instead of going out and look for one. By just sitting in front of your pc or any devices you can use to go online, loading is just a click away. 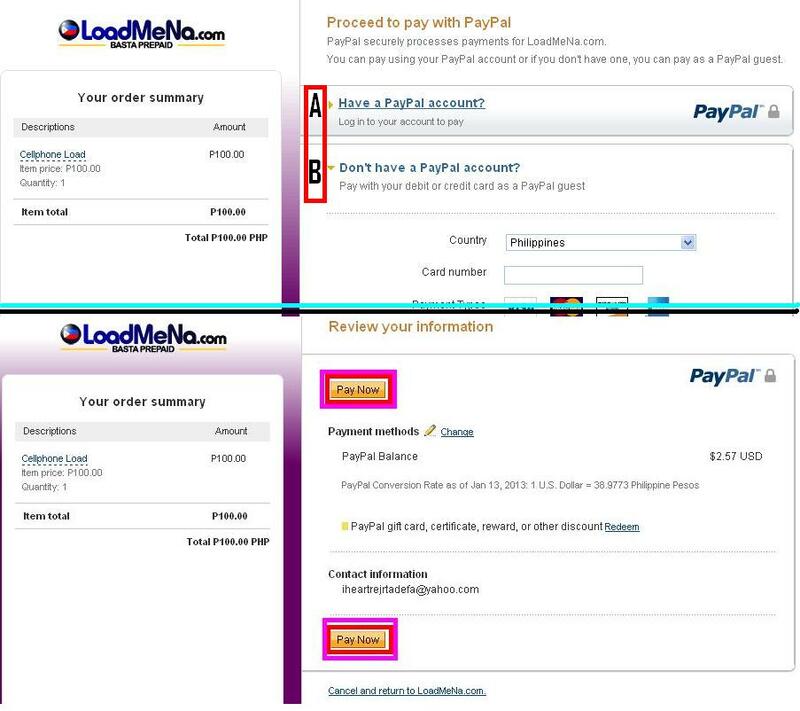 You can now load Smart, Globe, TM, Red Mobile and Sun Cellular online via LoadMeNa.com using your Pay Pal account or other payment method available. 2. 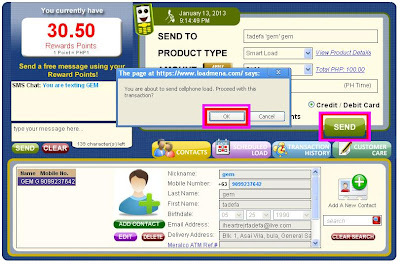 Create contact on where to send your load. 3. Select your payment type. Click "Credit/Debit Card" if you're going to use your card or Pay Pal account. A pop out box will appear and have to click ok.
4. You're on the Payment section. 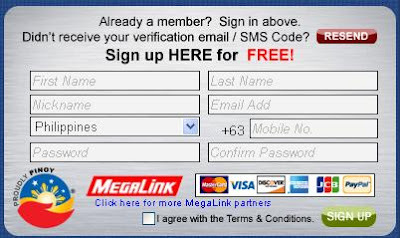 Enter your details and click "Pay Now!" 5. A message will appear saying that transaction is successful done. After doing everything, it says that you will received your load after 5 minutes yet with just a minute or less I already received the load I purchased from them. So I must say that they're really commendable. 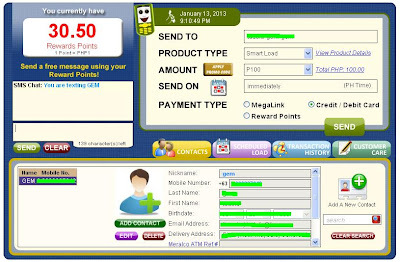 You will also received an email confirmation of your purchased or a so-called e-receipt. 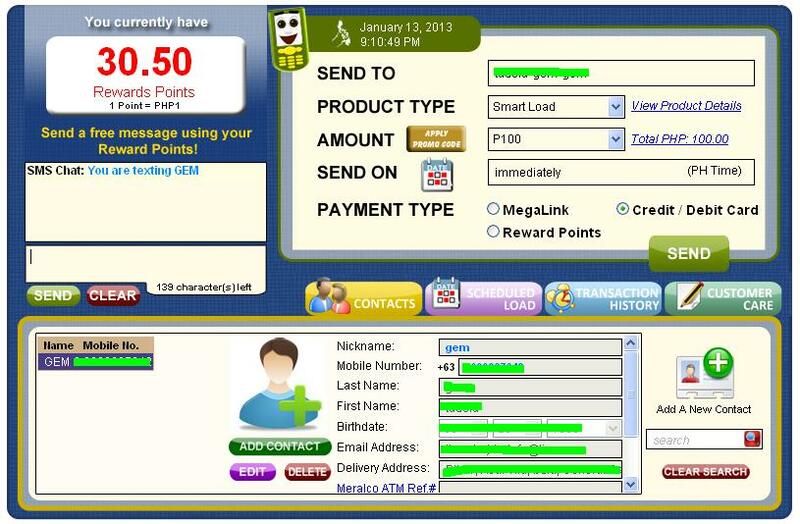 100php is just a sample transaction. Have to try it first by buying a smaller amount if it's really working. Tada! Loaded successfully! That's it! You have successfully bought a load from LoadMeNa.com.